And then everything goes wrong: The Farmer ends up in The Big City and the sheep, led by Shaun, realize they have to get him back. With vicious Animal Containment Officer A. Trumper on the warpath (an over-the-top, animal-hating villain to rival Victor Quartermaine from “The Curse of the Were-Rabbit” and Mrs. Tweedy in “Chicken Run), they’ve got to disguise the fact that they are sheep as they search for The Farmer. Along the way, they bond with a lonely mutt, Slip, who proves surprisingly helpful. To say more about the twists and turns would rob audiences of the pleasure of laughing at each new development. I can’t recall the last time I laughed so much in a movie. There are nods to previous Aardman films, Monty Python, Jacques Tati and “Silence of the Lambs” that kids might miss, but will add an extra smile for movie buffs. Unlike previous films, there’s no actual dialogue (even by humans), just animalistic groans and grunts that convey everything perfectly. In a world focused on animals, no one need speak at all. And stay for the closing credits as Aardman always entertains until the very last minute. Rated PG for some rude humor. 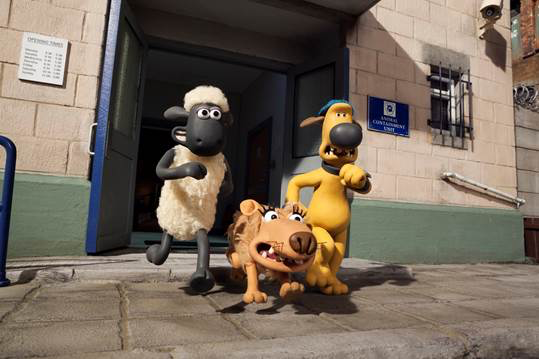 “Shaun the Sheep” opens on August 5. ← ‘Mr. Robot’ Dog Flipper’s Backstory Revealed!